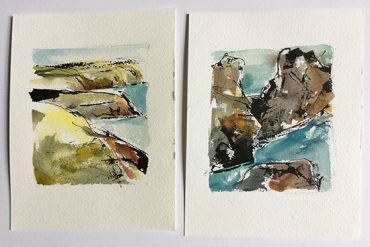 My work incorporates coastal landscape imagery, abstraction and calligraphy (either in words or purely gestural movements), so I was very glad to have a full two weeks at Brisons Veor to delve into some new work. After the second day (adjusting to the space, setting up the studio and feeling overwhelmed by the beauty of the location… quite daunting, really), I settled into a routine of production both morning and evening, leaving the afternoons free to explore the area, go for long walks, swim, etc. As I had to bring all of my supplies with me from overseas, I had only the essentials — it proved very efficient! 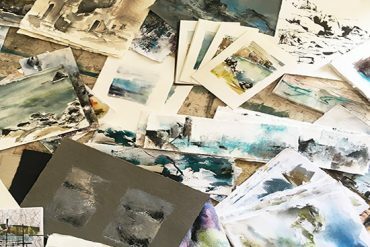 I work with water-based media on paper, primarily watercolour, ink and gesso on handmade paper, incorporating imagery, gestural movement and text. I knew that this location would be a perfect source of inspiration, not just for its seascapes, but for its rich geological and mining history. I actually fabricated and used some watercolour paint that I made onsite from mineral pigments found nearby.